Our popcorn fundraisers are some of the tastiest treats you and your supporters will ever eat! We offer 3 different brochures. 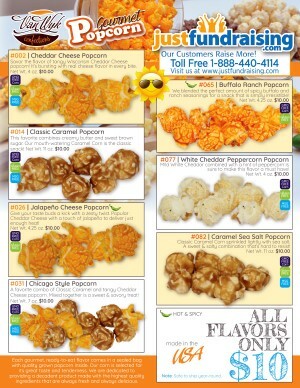 The first order-taker offers a selection of 6 caramel corn flavors, in a large format, all priced at $15. The quality is second-to-none! 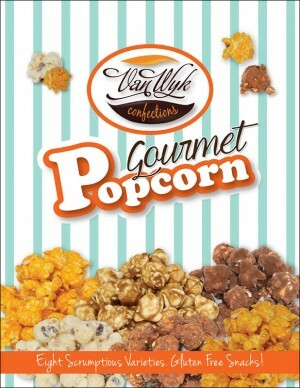 The next 2 popcorn order-takers offer a mix of 7 flavored, caramel and fudge popcorn, all priced at only $10 each. Get your popcorn fundraiser started now. This popcorn fundraiser is available year-round! Our seven irresistible Gourmet Popcorn flavors including Jalapeno cheese and Chicago Style popcorn, are sure to be a big hit. At only $10 a bag, your supporters will want to try one of each! 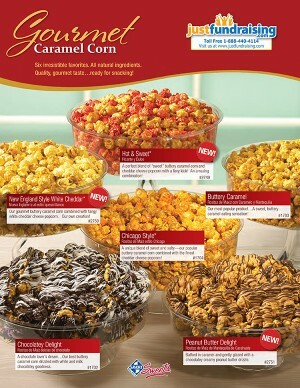 Our Gourmet Popcorn Fudge Collection features 7 popcorn flavors in all, including 3 fudge flavored popcorn items. The popcorn sells for only $10 a bag, so you'll find your supporters buying a few at a time. Important: This program only ships in weather cooler than 80 F.
Our six irresistible Caramel Popcorn flavors are sure to be a big hit. At only $16 a tub, your supporters will want to try one of each! Choose from Buttery Caramel, Chicago Style, Chocolately Delight, Louisiana Hot & Sweet, New England White Cheddar, Peanut Butter Delight. Important: This popcorn program only ships in weather cooler than 65 F.
Why Choose a JustFundraising.com Popcorn Fundraiser? Pure Deliciousness Sells: Who doesn’t love to snack on deliciously flavored gourmet popcorn? We’ve carefully chosen only the tastiest and freshest popcorn suppliers and programs to ensure your product sells, year-after-year! Get ready for repeat customers! Highest Profit Guaranteed! As withal of our fundraisers, if you find another company that offers a higher percentage profit on their popcorn program, we’ll match or beat it! Pricing is Very Reasonable: Both our $10 and $15 programs offer your supporters a generous size that allows them to feel just as good about their snacking as they do about their giving! Free Shipping: when your group sells over $1000 retail of popcorn, you get free shipping. A small group of 10, selling 10 units of popcorn each, is $1000 retail – easy, peasy. Personal Fundraising Assistance: our team loves to help groups reach their goals. Call us and provide tips on how to choose the right popcorn fundraiser, and execute your fundraiser to optimize your results. No Minimums: whatever you sell, you order – there are no restrictions on your popcorn order size. Free to Start: We’ll send your free popcorn order-takers so you can start fundraising immediately. How To Raise Money With a Popcorn Fundraiser? To start, select which popcorn fundraiser you feel is best for your group (we have a few tips below). Then, order 1 popcorn order-taker per seller in your school, class or team. Have them ask friends, family, close neighbors if they’d like to support your cause by purchasing one or more bags of delicious gourmet popcorn. Have the parents bring it to the office place for extra sales – who doesn’t like to snack on the job? After your two to three week fundraiser, tally up all the sellers’ orders on the master order form and fax or email it to JustFundraising. We’ll invoice you a percentage of the sale, and you keep the rest as pure profit. We’ll deliver your popcorn to you within 2 weeks, at which point you’ll hand deliver it to your kind supporters! Which Popcorn Fundraiser is Best For Your Organization? Firstly, figure out if a $10 or $15 price-point is best for your area. If you live in a more affluent area, I would recommend the $15 popcorn. Another big factor is the weather. The $15 popcorn can only be shipped in weather that’s 65 F or less, so it’s definitely a Fall, Winter and early Spring fundraiser depending where you live. The $10 Gourmet Popcorn program which has many fudge flavors, can be shipped in weather up to 85 F. Once your weather goes above 85 F, your only choice will be the year-Round Popcorn Fundraiser. So price-point and weather are 2 important considerations. Pick up the Phone: Tell your group members to pick-up the phone and call their close family and relatives and ask if they want to buy some of the best gourmet popcorn around. Use Facebook: Have them (or their parents if they are younger than 14) add a Facebook post encouraging their friends to support your fundraiser by buying a bag of popcorn – make sure to collect from them before they place their final order. We had one person sell 160 items all by herself, using Facebook alone. Communication: Clarify the financial goals and where the funds will be going. Throughout your popcorn fundraiser, communicate sales to date, tips on how and where to sell, and remind them of the importance of their participation. We had a group of 17 sellers and we raised over $1,300 in profit to help pay for competitions fees for our dance studio. We just raised $570 profit for our youth group at church - the profit we raised will allow us to cover costs for our Fall Festival including prizes and treat bags for our youth. Our sellers and supporters alike were really impressed with the unique flavors including white fudge with cranberries and caramel fudge popcorn. We were very pleased with the fundraiser! My husband and I sold 68 tubs of popcorn on our own! All of the money raised will go towards care packages for the homeless. Get Your Popcorn Fundraiser Started Now! Determine which of the three popcorn fundraisers above are best for your group, request your free order-takers and you’ll be fundraising in less than 1 week.